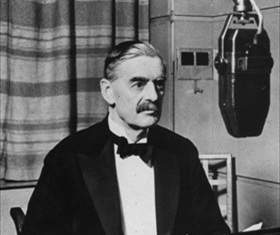 Addressing a national audience by radio, Prime Minis­ter Neville Cham­ber­lain in­toned the fol­lowing words: “This morning the British am­bas­sador in Berlin handed the Ger­man Govern­ment a final Note stating that, unless we heard from them by 11 o’clock that they were pre­pared at once to with­draw their troops from Poland, a state of war would exist between us. I have to tell you now that no such under­taking has been received, and that con­se­quently this coun­try is at war with Ger­many.” For Bri­tons, these words are as mem­o­rable as Presi­dent Franklin D. Roose­velt’s before a national radio audi­ence on Decem­ber 8, 1941, one day after the “Day of In­famy.” At mid­day Cham­ber­lain spoke to Mem­bers of Par­lia­ment, saying: “This is a sad day for all of us, and to none is it sadder than for me. Every­thing that I have worked for, every­thing that I hoped for, every­thing I have believed in during my public life has crashed into ruins.” As part of the pre­para­tions for the en­suing war, Cham­ber­lain recruited new mem­bers to his cabi­net, the most not­able being Winston Chur­chill. For months many in the Eng­lish press had clamored for Chur­chill’s return to govern­ment—the vet­er­an poli­ti­cian had been “exiled” by his Con­ser­vative poli­tical party in Decem­ber 1936 and later became a vocal critic of Cham­ber­lain’s “appease­ment” approach to Nazi Ger­many. Cham­ber­lain’s taking Chur­chill on board was a cou­ra­geous and popu­lar way to strengthen his party’s war­time con­trol of govern­ment. The prime minis­ter gave Chur­chill the cabi­net post of First Lord of the Ad­mi­ralty and in­vited him to sit on the nine-mem­ber ad­vi­sory War Coun­cil. With­in nine months a sick and war-weary Cham­ber­lain in­vited Churchill to re­place him, which hap­pened on May 10, 1940, the day Ger­many in­vaded France and the Low Coun­tries. Chur­chill’s adept war­time leader­ship and his elo­quent use of lan­guage pre­pared Britons for a long war against power­fully armed and deter­mined aggres­sor states in Europe and Asia. By refusing to con­cede defeat to Ger­many through the Battle of Brit­ain (July to October 1940) and the London Blitz (Septem­ber 1940 to May 1941), Chur­chill kept British resis­tance alive until joined by the United States on Decem­ber 11, 1941, when Hitler, five months after picking a fight with the Soviet Union, foolishly picked one with America. 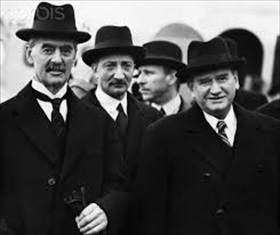 Right: Chamberlain and French Premier Édouard Dala­dier, 1938. On the evening of Septem­ber 3, 1939, Dala­dier addressed his nation by radio, telling French citi­zens, “We are at war because we have had it im­posed on us.” Dala­dier shared Cham­ber­lain’s moral rejec­tion of war, but he also came to realize the futil­ity of avoiding a direct con­fron­ta­tion with Hitler’s Ger­many. In March 1940 he resigned his post but remained in the govern­ment as defense minis­ter and then as for­eign minist­er until June 16, 1940, when in­vading Ger­man troops seized Paris. Dala­dier fled to French Morocco, where he was later arrested on charges of tre­ason by the col­labo­ra­tionist Vichy French govern­ment of Marshal Philippe Pétain. He was impri­soned in France until 1943, after which he was handed over to the Ger­mans and spent the remainder of the war in German captivity.